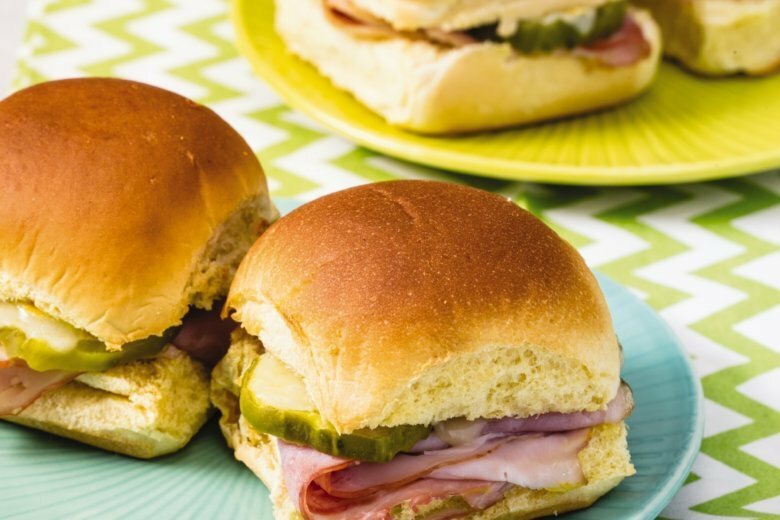 Take your ham and cheese sandwich to the next level by turning it into a slider. Fluffy potato dinner rolls are just the right size for a few bites. Heating these small sandwiches in the oven makes the rolls nice and crisp and the cheese melty and gooey. You can also make these sliders in a toaster oven if you have one. To make a whole bunch of sliders for a party, double or triple this recipe (to make 8 or 12 sliders) and heat them all on one rimmed baking sheet in the oven. Follow this recipe with your kids. Adjust oven rack to middle position and heat oven to 400 F. Line rimmed baking sheet with parchment paper. Use butter knife to spread mustard evenly over insides of rolls. Layer 1 slice ham, 2 pickle chips, and 1/2 slice cheese into each roll and press down gently (you should have 4 sliders). Place sliders on baking sheet. Place baking sheet in oven and bake until cheese has melted and rolls are crisp, about 5 minutes. Use oven mitts to remove baking sheet from oven (ask an adult for help) and transfer to cooling rack. Use spatula to carefully transfer sliders to 2 plates (baking sheet will be hot). Serve. Nutrition information per serving: 364 calories; 104 calories from fat; 12 g fat (5 g saturated; 0 g trans fats); 40 mg cholesterol; 1341 mg sodium; 49 g carbohydrate; 2 g fiber; 6 g sugar; 20 g protein.